If you have multiple offers, or points of entry where you generate leads, I like ONTRAPORT a lot. You can build out centralized campaigns which make it very easy to manage your messaging and monitor performance. They're also good for multiple users, as each user can customize the interface to suit. I don't really like ONTRAPORT for a CRM though. 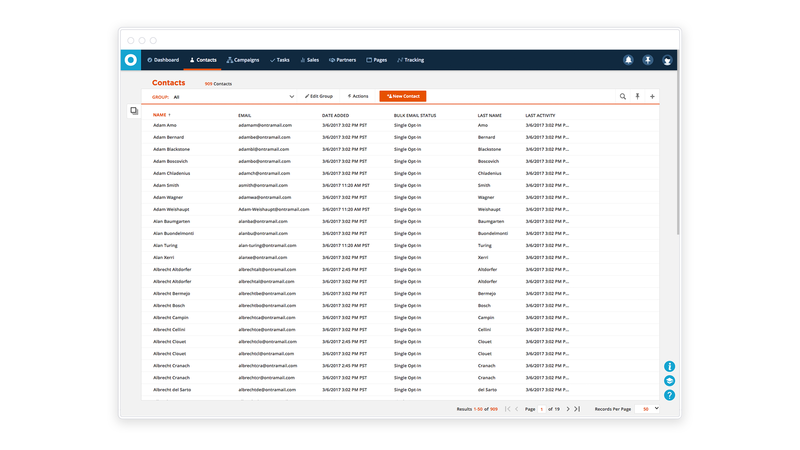 It automatically lets sales people and marketers know which contacts in the database are the most active and even allows you to see which web pages a particular contact has visited. The marriage of rules and sequences allows us to sit down with clients and map out their marketing, sales and customer service processes and then program ONTRAPORT to carry them out. The business guides the software, not the other way around. ONTRAPORT encourages a mix of communications; email, post card, postal and text messages. This helps keep the relationship real with the contacts. They don't feel like they are just on an email list. They are communicated in a way that matches their behavior and preferences. You can't add a contact without an email address. Site tracking of visitors sometimes doesn't work, so when they submit a form their activity prior to form submission is lost. Sales/CRM reporting is very limited. Anyone coming from a proper CRM like Salesforce would find reporting unusable, especially sales teams. Email builder needs some work, it has certain limitations and doesn't allow custom designs to be editable in the builder. No Android app for CRM (suppose to be in the works as we were told). It meets our every need: email marketing automation, effective tracking and tagging, sales, reports, CRM - ONTRAPORT is #1 for me. The software is just easy to use. The UI is fairly intuitive. The help system is pretty good. I find it is pretty quick to get my work completed and if I don't document my things well, I can always figure out how I did something when I need to make changes.When I have a problem the tech support is easy to deal with and when things need to get escalated they are resolved quickly. I went to their Ontrapalooza event, and it opened my mind as to how the software can be used. ActiveCampaign is the only option (compared to ConstantContact and MailChimp) for creating marketing automations and drip campaigns. If you don't need automation, Constant Contact and MailChimp are a lot easier to use. Infusionsoft - I chose ONTRAPORT over Infusionsoft because I could make it match up to my clients processes easier. I value the flexibility. On the flip side, Infusionsoft has some eCommerce integration and pre-configured solutions that are appealing.VTrenz, Marketo, Silverpop were all on the list back in 2008 when I looked at them but they were overboard on roles and structure not to mention unaffordable for small and midsize clients. With the new lower priced options, it's now easier for newer businesses to start with a more basic version and upgrade as they need more features. It helped me to grow my list substantially in just 3 months. It helped me to increase traffic on my website. This application played a very important role in the success of our new product which we launched in the first quarter of this financial year. We got very good response on our promotional campaign. We have been meeting the needs of clients with this tool since 2008; exceeding revenue expectations. We have clients that set goals to get 100 leads. We end up getting them 1,000. Granted a lot of that is in the campaign strategy but the tool is legit. Contacts Screen - View and Group all of your contacts from one screen. Packages are priced on a month to month contract where you can cancel your account at any time. Clients may opt-in for an annual contract, where they pay for 10 months up front and the last two are "free".